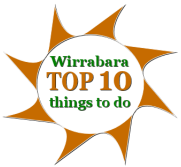 Nestled on the banks of the Rocky River in the beautiful Southern Flinders Ranges, Wirrabara is an idyllic country town approximately 235 kilometres North of Adelaide. Home of the first established Government Forest nursery in Australia (1877) the town is renowned for its Forestry Heritage and it’s rich Farming History. Wirrabara gets its name from a corruption of two words from Kaurna (Adelaide Tribe) language “wirra” and “birra” gum trees and running water and in the local Nukunu language “wira””parl” gum trees with honey and water. The area was first settled by Europeans in 1844 when the White Brothers took up pastoral leases north west of what is now known as Wirrabara. They called the leases the Charlton Run after their home town in England. An old Mine chimney can still been seen on the spot where the Charlton Copper mine operated in the 1850’s. Later the owners changed the name of the run to Wirrabara from which the town took it’s name when it was established in 1874. The owner of Wirrabara Station at that time was A. B. Murray, breeder of the famous Murray Merinos. Wirrabara today reflects its proud heritage, with an active timber industry, healthy farming community, creative business owners and a township that supports both the old and the new. Visitors are welcome to share in the history, and experience the idyllic atmosphere of a small country town.